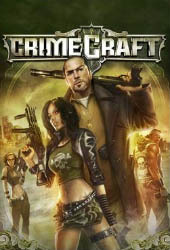 CrimeCraft combines the best persistent world RPG features (thousands of players, guilds, PvE and PvP battles, missions, loot, crafting, trading) with the action and skill-based gameplay of a shooter. Players can access combat, customization, equipment shops and social features via Quickplay interface or choose the full-featured Sunrise City experience. Join a gang, recruit members, pool resources, outfit your gang crib, and battle for control over territory. Rule the streets of Sunrise City with your gang’s logo displayed throughout and recieve valuable spoils. Experience immediate and intense combat action using over 20 distinct class profiles, each providing all necessary equipment including weapons, clothing, ammo, boosts, abilities and gadgets. Or create your own custom profile to suite your playstle. You choose.